If you haven’t read Olive Kitteridge by Elizabeth Strout, go buy a copy now. You’ll want to read it more than once and to share it with others. I first blogged about Olive in 2009 after this novel of interlocking stories won the Pulitzer Prize. The author spoke last Sunday to a group of library volunteers in my town of Brunswick, the place which inspired her work of fiction. She said that libraries are the “fireplace of a town.” Children’s book editor and author, Kate Egan moderated the discussion. Elizabeth gave me permission to share my synopsis with you. Despite her phenomenal talent, Elizabeth’s road to publication was long. She suffered through years of rejection before her stories were printed in literary journals and in magazines. Even after those publications, it took her a couple of years to find an agent and a publisher for her first book. 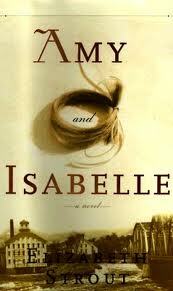 She was forty-one years old when Amy and Isabelle (1998) was published. Amy and Isabelle is a disturbing tale of a teenaged girl having an affair with her teacher while her relationship with her mother deteriorates. The narrative has a linear and predictable plot, but it is still impressive for a first book. The novel is set in a former mill town like Brunswick, except with greater economic hardships. The original cover image (at left) features the Bowdoin Mill in Topsham, across the river from Brunswick. The art designer found the old photo in a drawer at Random House. Locals might notice that the image was reversed. By coincidence, Elizabeth’s husband had also worked in that mill a long time ago. I have a personal connection too: that old mill building houses my doctor and the Sea Dog Brewery, a favorite spot for a pint or lunch by the river. Olive Kitteridge is set in fictional Crosby, Maine, but references to Cook’s Corner and other Brunswick spots places the narrative in my town. When asked if Olive is a novel or a book of stories, Elizabeth replied that it is “whatever you like.” The stories all include Olive, but sometimes as the main character and other times as a minor character. Her reason for this variance was that Olive was such a large character. If Olive had been on every page, the reader would have been exhausted. Without an obvious structure, the stand-alone stories work together to build the narrative arc of a novel. Only 270 pages long, this expertly crafted book has depth, heart and soul. The first Olive story came to Elizabeth while working on her second novel, Abide With Me (2006). She got a vision of a woman standing by a picnic bench at her son’s wedding, waiting impatiently for the guests to go home. Looking back at other unfinished stories, Elizabeth realized they were all waiting for Olive. From there, she wrote even more Olive stories. The book structure came subconsciously while Elizabeth moved the stacked stories from her desk to a suitcase to share with her editor. Although the book went through editorial changes, the original order of the stories remained fixed. Elizabeth has a few Olive stories left over but doesn’t plan to share them. The next time we see Olive will be on TV. The book has been optioned by Francis McDormand for HBO. I asked Elizabeth about her manuscript editing process. For the past 28 years, she has only had one writing critique partner. When asked about grammar and style, Elizabeth replied, “I love a semicolon and a nicely placed adverb.” She has only worked with one editor, who has recently retired. Someone new will be editing her work in progress. Her advice on writing was to keep reading; I can’t wait to read her next novel. Elizabeth was a wonderful speaker. She was articulate, sincere and often hilarious with an almost British sense of self-deprecating humor. I found her personal story inspiring since I’m also trying to get published in my 40s. 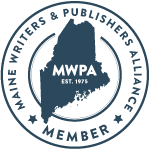 I've set my novels in mid-coast Maine too. Storm Watch: my college roommate, Deb Sabin, wrote an amusing letter in The Boston Globe about the up side of the October blizzard. Book lovers will enjoy this. The mill brings back of crossing that metal bridge every day to get to school while growing up. I can't really tell that it is reversed. I always enjoy reading books that allude to Maine. Cook's Corner is another favored spot for me as I lived there for a while. I'll have to check out her books. This is a fantastic piece. I saw Elizabeth Strout at Swarthmore a year or so ago — so in love with Olive. I loved how down to earth, how unpretentious she is. We need more authors like her. “fireplace of a town.” I loved that quote and I will be borrowing from now onwards, crediting Ms Strout, of course. There's a unique and peculiar trait of authors who are deeply rooted in a place and then write about it. It's almost like a two-way creative process. They wrap their work up with the power of universal and generic features, whilst providing a snippet of the mundane and ordinary. I loved the way she described how Olive came to her. Frances McDormand, the actress? Oh, my God, I loved her in Fargo! Olive Kitteridge was one of the best books I read last year. Wonderful. I just downloaded Olive Kitteridge and will begin reading tonight. Love anything that takes place in Maine, of course. Thanks for the suggestion. 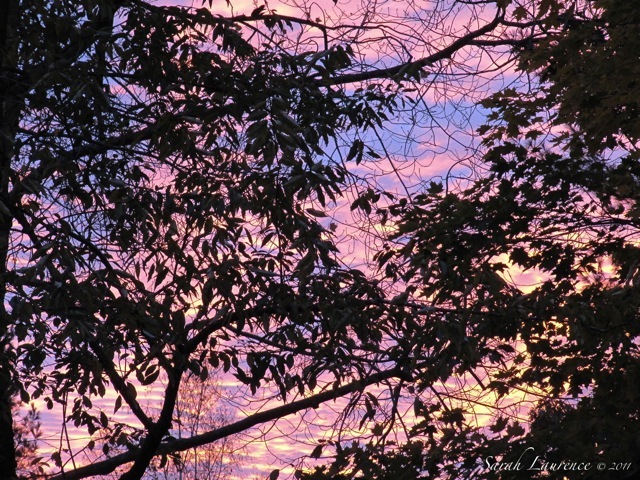 Sarah, I clicked through the link of Deb Sabin's article...LOVED it! Shared on Facebook. Why is it so hard to get kids to read?!? So thankful that my daughter loves to spend her time with a book but my son is a completely different story and it kills me! I've heard about this book before and will be sure add it to my to-read list. It sounds interesting, and I like that she includes real places, from your very own town no less! I like your roommate's letter! She's right! I love a semicolon, too; it's one of the great (and underutilized) punctuation marks. Olive Kitteridge was one of the most memorable books I've read in the past few years. I think it's time to read it again. I often think of her planting her tulip bulbs each spring, and her unexpected, late-blooming romance, and her penchant for giving advice to difficult and troubled teenagers. I wish that I could have met Elizabeth Strout, too! Tina, my favorite was Olive Kitteridge. Beth and Pamela, I knew you’d be fans of her work too. ACIL, the HBO show is not definite but I could see McDormand as Olive. It would take a powerful actress. Cid and Donna, let me know what you think of Olive. Love or hate her, she is a complex character. Cat, I passed your comment onto Deb. You made her day. Bee, you know about me and semicolons; I can’t resist them. Thanks for sharing your Olive memories. After meeting Elizabeth, I felt like I knew Olive better too, although they are very different. Thank you for this post Sarah. I was about to purchase Olive Kitteridge a few weeks ago and put in back on the shelf in favor of "The Invisible Bridge" by Julie Orringer - which I am enjoying. Joan Didion's "Blue Nights" is on my bedside table waiting to be read too. Have you read it? After your review I will definitely reconsider and get Strout's book. Bonnie, I think you’d find Olive’s complex character fascinating. My teenaged son loved Invisible Bridge, but I got bogged down in the middle. I have not read Blue Nights. Will you review it on your blog? Bonnie, I’m so sorry about your daughter’s diagnosis. These must be stressful times for you and your family. Tricia, you would appreciate the quality of the writing. Must read both these books! I apprecaite your reviews~they are always helpful and honest. Have a great day and week end. I loved hearing all these details about Elizabeth Strout. I recently reread A & I--just amazed all over again with so many aspects of this book. Did not love Abide With Me as much. 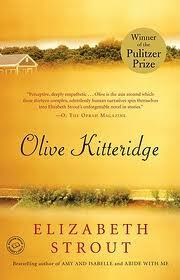 Read Olive Kitteridge just as soon as it was published and loved it. Strout's writing is exquisite. Thanks for sharing her road to publication. Enjoyed your last post and seeing Scout romp in the snow. I know our Sophie and Coconut will be equally excited when we get our first snow. Congratulations to your son for his success as a Shakespearean actor! I agree, though, about "Taming of the Shrew"--I have a hard time enjoying that one nor do I care much for "The Merchant of Venice." How is a puppy similar to a 17-year-old boy?